If you are tired of wasting your money at the salon, consider getting a manicure set to help you achieve the results you want from home. Look for a gearbox that offers professional-grade nail tools that will last you (almost) forever. The right set depends on your budget, tastes and preferences, the equipment you need and the condition of your nails. We made a list of some of the best manicure sets available, in order to help you choose the one, which will suit you best most of them are not only suitable for manicure but for the pedicure maintenance and grooming as well. You may ask yourself what actually is a manicure set? Manicure kits are essential accessories that are ideal for smoothing the skin, grooming nails, and such imperfections as dead skin, hang nails or calluses. The gearbox contains high-quality components such as nail scissors, cuticle nippers or pushers, nail clippers and many others which are easy to use and offer professional results with proper usage. If you choose wisely, you can save hundreds, just because this is one very economical alternative. You can still get that perfect nail design and healthy nails on your own at home. If you ran out of ideas for gifts, we think that kit like this will be the perfect acquisition to any nail lover. Our first suggestion, is a model, which contains everything you will ever need from a kit. 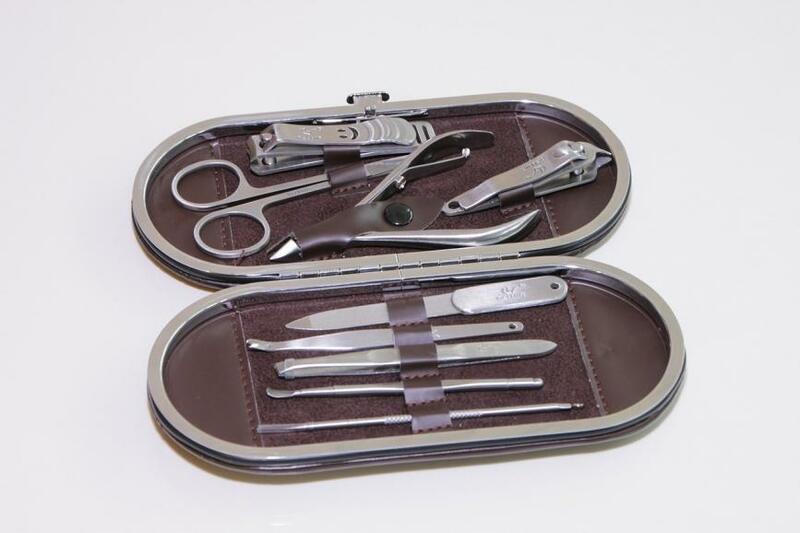 The set is equipped with various professional manicure essentials such as cuticle trimmer, multi-purpose scissors, V-shaped push stick, single-edged double-sided push stick, thee nail clippers, ear pick, nail file and tweezers. You can carry it around wherever you like, as it is safely housed in a delicate leather case. The advantage of this product is that it is very affordable for the things it contains. Every tool in it is a high- quality one, in order to ensure you that achieving the perfect manicure is possible anytime. We strongly believe that this is one of the best kits to invest in. This product is perfect for people who are tired of changing their manicure sets. We can assure you that it is a high-quality one, as it contains everything you will need to make a great manicure. The tools included here are the slant tip tweezers, the stainless steel fingernail clippers, deluxe stainless steel toenail clippers with nail file, stainless steel nail nippers and nostril scissors. You can breathe quietly, because all of the tools are protected in a soft and supple black genuine leather case. The manufacturer is the world-class Japanese company Seki ednge, which guarantee for their products’ endurance. Each tool will last you for years, as they are all make of quality materials. This product is the most expensive one in the list, but the quality worth the price. Each tool is make with precise cutting edges in combination with smooth design, which saves you time and makes you manicure perfect for just a couple of minutes. You will be impressed with how sturdy it is. If you don’t think this product is your cup of tea, then Seki Edge have a wide range of grooming kits, which will definitely catch your eye. If you try to choose a kit, which resembles what you would get at the salon, than this might just be your product. It is a complete system, which offers professional results at the comfort of your very own home. Its unique all-in-one design is perfect for everyone. You can get the so wanted nail design for just a couple of minutes with four easy steps. The 12 attachments included offer you quick smooth, shaped and polished acrylic or natural nails. 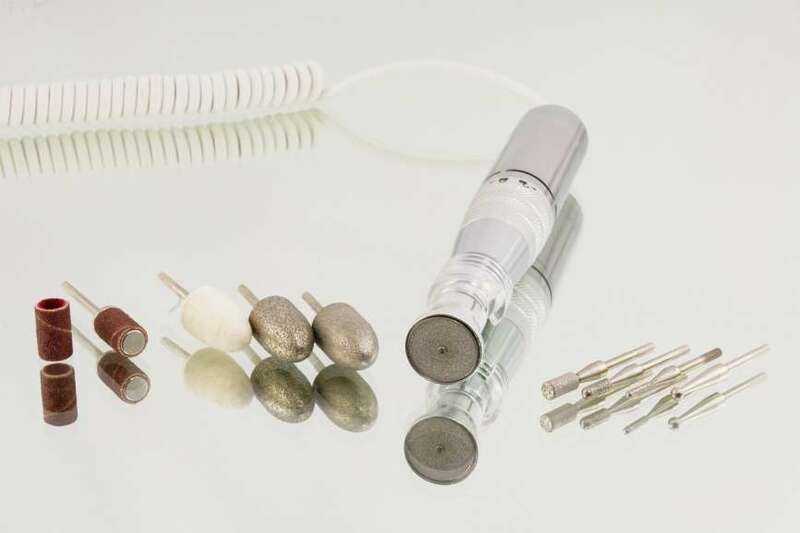 The 12 attachments included here are small, medium and large sapphire cones (for the acrylic nails), metal shaping plate, medium stone cone, metal smoothing plate a buffing plate, shaping, buffing and smoothing disc, a smoothing plate and a cuticle shaper. The whole system is rechargeable, as it has a light and several speed control, which will make the results flawless. You will also get a built-in nail dryer, which will dry your nails in no time, saving hours. There is also a manicure bowl, which is able soften nails and cuticles. You can take the whole system with you everywhere you want thanks to the bonus travel pouch. It can be used by both men and women. This product contains eight quality manicure and pedicure tools, such as small and large nail clippers, nail pusher, hoof stick, cuticle and nail scissors, sapphire nail file, and tweezers. The kit can be used at home and taken on vacations, as it is enclosed in a high quality artificial leather case. If you consider buying it as a gift for someone, it comes in an attractive gift box. The company also has bigger sets with 10, 16 even 23 pieces in, which is perfect for people who require more. The company has a long experience in this business, as it was found in 1927 and ever since crafted one of the best tools using superior workmanship and materials. The product is on a reasonable price and it is definitely a great value for the money. Our last suggestion is a product that will satisfy the needs of both natural and acrylic nails fans. This kit contains a powerful professional drill, which is perfect for your home or if you are an owner of a salon. It is effortless and it can be used by beginners and professional artists. The drill can be used on all kind of nails and polishes used, as it is also portable and slim. It does everything- from file, buff, and shape the nails to insert nail charms and remove calluses. The tools are designed especially for your rnails. The drill has several speed modes and can easily switch the chrome-plated attachments. The usage is easier and convenient, as the switch is on the unit and not on a foot pedal. The drill is lightweight and it is excellent for keeping your natural and artificial nails on point even at home. The instructions are really helpful, but we think that you will get the idea and master your skills in no time. This drill has been around for many years and a lot of people think that it is one of the best on the market.